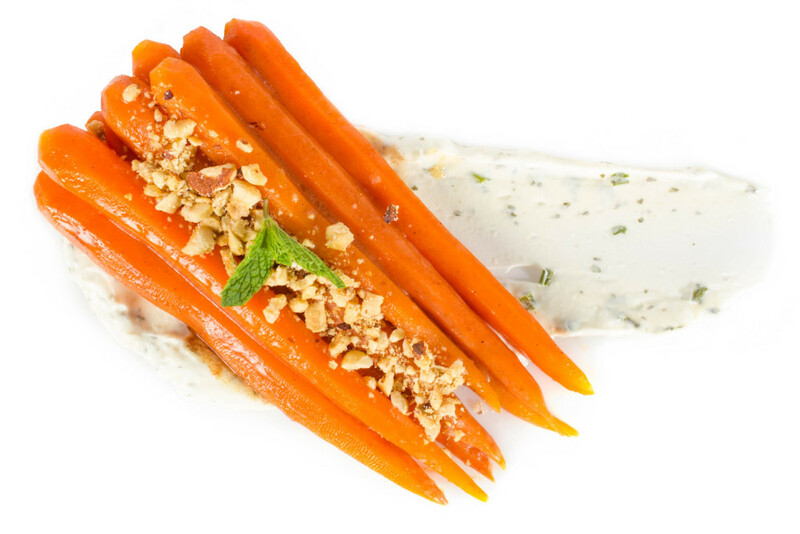 Carrots are delicious on their own, but with a little butter, honey and 45 minutes in a sous vide bath, they become exceptional! In this recipe, we add crushed hazelnuts and a yogurt spread to the presentation to give the dish contrasting textures. We like to use young carrots (the smaller ones, often with their greens still attached) as they are more flavorful than their full-size counterparts. Vegetables are composed of plant cells, which are extremely tough and resilient compared to the cellular structure of meat. Veggies have to be tough – they can’t jump out of the ground and run away from predators. These strong plant cell walls are also what give raw carrots their crunchy snap. To transform firm, raw carrots into a tender and yielding side dish, we have to break down those cell walls. Unlike meats, which typically cook between 50°C / 122°F and 65°C / 149°F, vegetables require much higher heat to soften. With a few specific exceptions, like corn and zucchini, most vegetables soften at temperatures between 80°C / 176°F and 88°C / 190°F. This recipe will produce carrots that are tender enough to cut with a fork. The butter, honey, cinnamon, and the juices released by the carrots themselves combine to form a sweet, sticky glaze that make this dish a classic springtime favorite. Combine the carrots, butter, honey and cinnamon in a vacuum bag* and seal. To serve, spread a thin layer of greek yogurt or crème fraîche onto your serving plates. Using tongs, carefully remove the carrots from the Ziploc bag and place atop the yogurt. Drizzle the liquid contents of the bag over the carrots. Finish with a sprinkle of chopped, roasted hazelnuts and flaky sea salt.